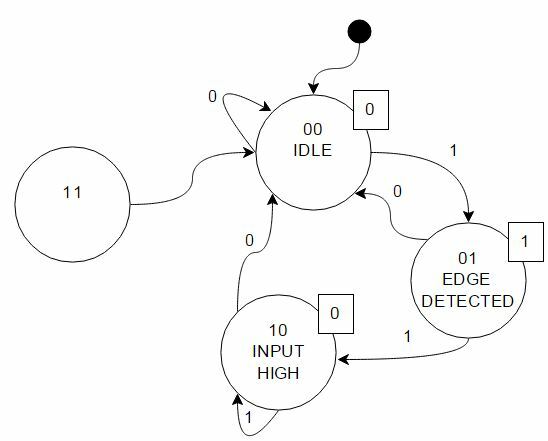 State machines are everywhere, from a simple edge detection to washing machines to CPUs. The State Machines we will talk about have a finite amount of states those are called Finite-State-Machines (FSM). We directly start with a small State machine (I skip all the talking about washing machines and stuff, just read through this and you will get the idea). Lets assume we want to detect a rising edge of a signal. Just in the clock period where the input changed from 0 to 1, the output should be high. 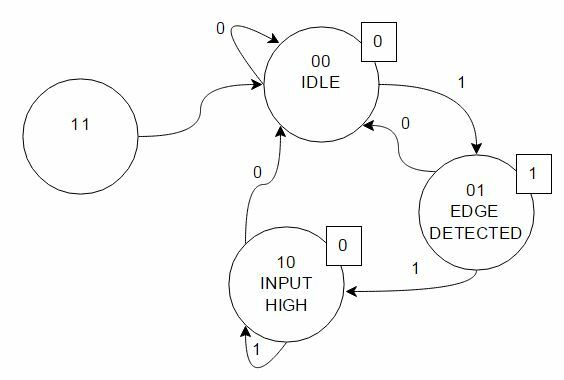 You may notice that there is a delay between input and output, the reason is that the input is checked on the rising edge of the clock and if there was a change from 0 to 1 the output will be set to 1 for 1 cycle. 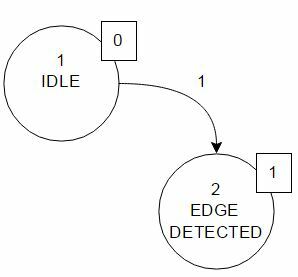 So we simply need to assign the output to the "edge detected" state and we are done, but before we do so, we go a bit more into the theory, first of all we introduce state diagrams. 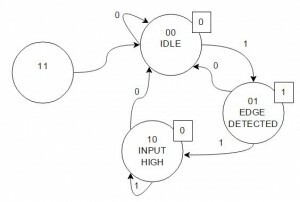 Due to the simplicity of the state machine and because I don't want to to mess up the diagrams the variable names are skipped in the diagrams, for more complex state machines they have to be added next to the input and output. both show the same, in this state the output is 0. The step of going from one state to the other is called transition. Every transitions comes with a condition, in our very simple example this is the input. We can see that if the input is 1 we change to state 2. As we want to work in the digital domain we need to change the state numbers into something machine readable. There are different approaches, like gray code or "1 hot" but we want to keep it simple so we just use normal binary numbers. Great, so we have everything, lets bring it into hardware! 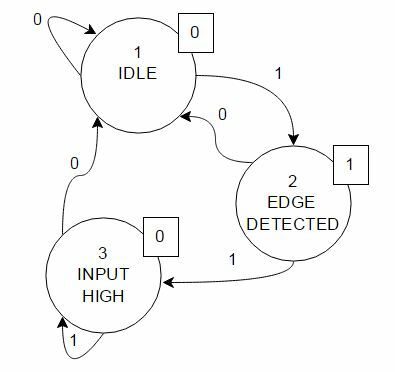 The way described above is how you would implement in software, if we talk about hardware we need to simplify the structure, this will also make the implementation in HDL more efficient. We split the bits of the State into S1 and S0. S1* and S0* describe the state that is followed by the condition on the left side. For now the output depends on the current state. Ok, lets fill that table! Based on this truth table we can set up logical conditions for the output variables. 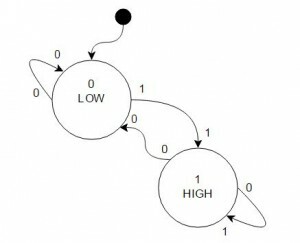 The way of how to implement a State Machine that was shown above was a Moore Machine. 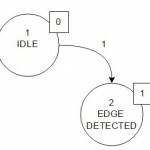 There are different ways on how to implement a State Machine, which one to use depends on the task and the requirements. 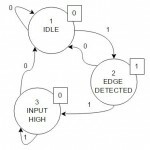 However, Moore and Mealy State Machines are the most common ones. 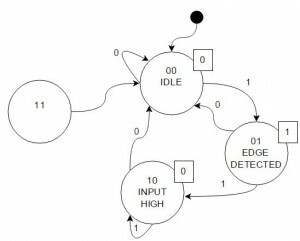 The difference is that Moore based machines create the output based on the current state. Each state has a defined output (as we did above). you immediately can see that this is now more compact than the Moore machine. For and simple example like this, the solution above might be the intuitive way, but for more complex requirements its usually not that obvious. Excellent post, Thomas, this is what I needed to get me started with the LUT component for the PSoCs. Hopefully you can keep working on the blog, you have some very interesting content here!